Last few days I have been working with Amazon Web Services micro instance free tier, this post I want to explain how to setup instance, elastic IP configuration, cloud instant accessing from local computer using Putty and FTP connection. It’s awesome real cloud computing, you have complete control on server, using this we can implement new web features like node.js. Soon I’m hosting all of my demos into EC2. Amazon providing 720 hours free tier micro instance box. Very first you have to create an account in Amazon.com with valid credit card and then activate micro free tie. Click here to access Amazon console dashboard. Most important part in this installation process. Click Create Key Pair button. 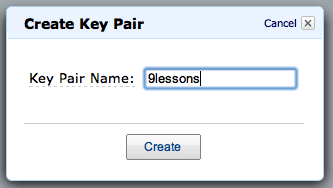 9lessons key pair has been created. You will get download save alert, save the .pem signature file into local directory Eg: D:/. 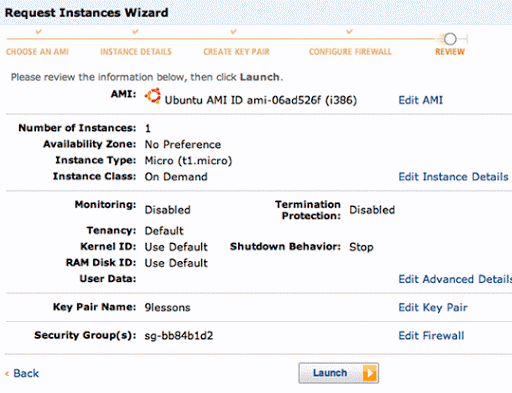 Amazon EC2 dashboard will show created Key Pair and Fingerprint. By default Amazon providing default security group, I recommend use the default firewall or you can create new security group like eg: Egglabs. Here you have to choose cloud server OPERATING SYSTEM. You can search in Community AMIs. Start icon references to free tier for Micro box users. I had selected Ubuntu Natty Operating System 11.04 server. Instant details you can give any name. Configure firewall choose default security group. Now you instance cloud compute ready. Right click on the running instance and click connect. You will get connecting help alert. 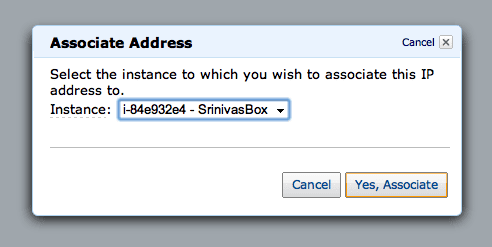 Amazon generated an IP address, now map IP address to Instance box (Eg:SrinivasBox). While clicking on Associate Address button. Associate instance and click YES button. Executing following command in Linux terminal you can directly access your box. Run PuttyGen.exe click Conversions -> Import Key. Choose 9lessons.pem the Key Pair. In Parameters select Type of Key Generate SSH-1(RSA). Click Save private key. Same directory Puttygen will generate .ppk file (private key). 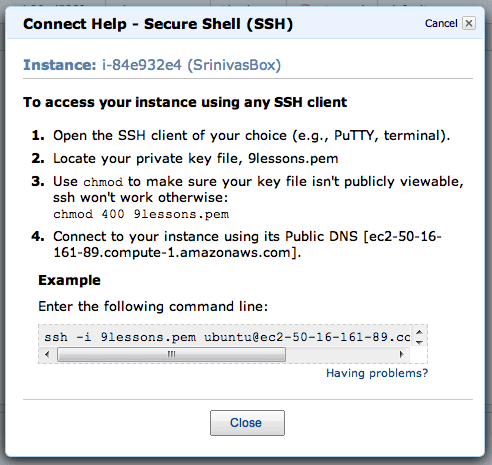 Category -> Connection -> SSH -> Auth browse and select .ppk file the click Open button. Now your web services is ready. 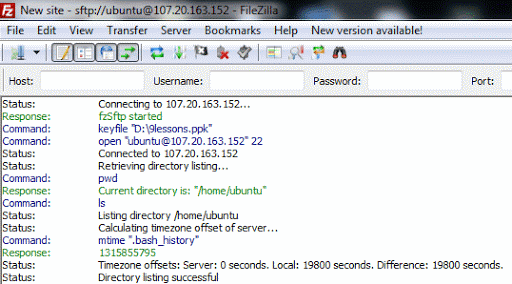 You can upload your files into /var/www/ directory using FTP. Using the open source FTP tool you can upload files into Amazon EC2 instance box. Download here and install into your PC. Now Got File-> Site Manager click Connect button. 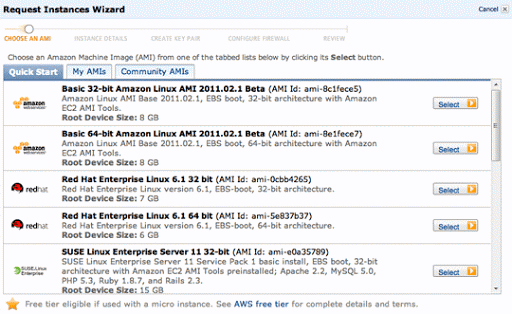 Now you can upload files from local PC to Amazon EC2 Instance Cloud /var/www/ directory. Really nice article Srinivas. I liked that attention to detail in this article. Good work. Keep it up. why do you use amazon web services. i'm not familiar this service. is it a standart web hosting service? why is it used? I was looking for it !! Step 6: Authentication with private key. When I click open, the cmd pops up and after sometime it says "Network Error: Connection timed out"
I have successfully setted up everything as instructed in this article but my elastic IP does not work in browser! Is there anything I will be missing here! Just for your reference, if anybody else encounters this. I had two issues while setting up EC2. 2. I was not able to make http request via my elastic IP. To resolve this, I had to add port 80 in my Security Group(Port range field) which fixed the issue. Wow... that is complete article. I'm happy to subcribe your newsletter. I'm new to this, the lack of this article is to describe what for/final goal we rent service in amazon EC2. Is it to host file for download, to make complete hosting etc?? i hope you explain this for the future newsletter, it can easily read for entire level. btw, can we make our hosting to host website using amazon EC2, sell reseller space etc?? Srini....Thanks a lot....This tutorial helps me, to establish the key pair ssh connection in my rackspace cloud server. Your articles are RELEVANT and VERY straight to the points. i was not able to connect into my FTP. Srinivas can you help with it. 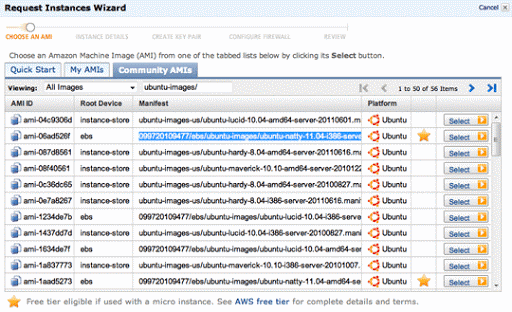 How many Instance EC2 , we can create FREE ? 1 instance EC2, can run 720 hours FREE per month with 10GB Space, 15 GB traffic. 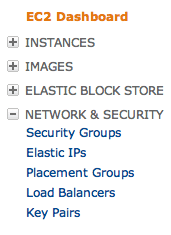 But i see, we can create many and many instance EC2 and create over 10GB Space without any alert from Amazon. So, I don't know they will charge us or not. This is really a very useful and unique post about this topic. Saved my lot of time. Thank you very much for sharing. thanks , amazing post . how can i use my own domain name on Amazon EC2 ? Excellent Article Srinivas. We are planning to migrate to amazon and this would be really helpful. Really great article Srinivas!!! Thanks a lot! so...again..that was a great article!thnx! I was unable to ftp to var/www. I think it needs root user. how do i connect as root? i created an instance n connected to window server 2008 through RDP using public dns. i installed tomcat, mysql, n shockwave flash plugin n run my project. when i gave the same public dns in my local browser it doesn't work. i tried it with elastic ip too. could u pls give me some solution to this. any sort of help is very appreciated. i have already amazon connection and i also upload file in server. but i want show frontend in url.. I am very interested in Amazon EC2. But I do not really understand the price. After the free year I would like if it's expensive. And you Srinivas Tamada, how do you pay per month (or year) for your site labs.9lessons.info? Great post. Any reason for choosing Ubuntu over Amazon Linux? Hello, we are trying to have Facebook / Twitter logins for users on our website. So they can basically use their FB/TW logins to access our website's services. The same implementation works on our site hosted with Godaddy. But in case of EC2 Linux - Suse instance it does not work. Any settings we need to do at the firewall end? And when I have all setup, I tried to access from my elastic ip but not work. 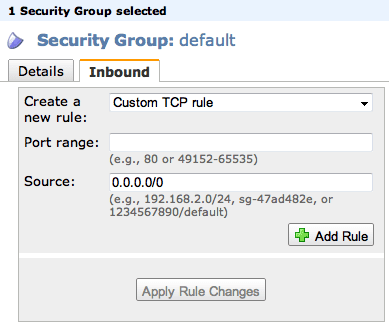 Looking I just add the rule HTTP on 80 and MYSQL to my Security Group. I must add manualy the port 80 and others because my default secure group has less ports then yours. I have configured my amazon as per your instructions everything is working fine. I just want to know that..do i need to sign up database service from amazon...? How can i connect to mysql database...do i need to to buy a RDS...? I have followed each steps mentioned by you but both public DNS and elastic IP are not responding. Please suggest me what to do, i am new amazon ec2. How can you redirect your domain to an EC2 instance? I cannot upload files to my amazon ec2 ubuntu instance var/www/ folder with user ubuntu .. permission denied occurs. I am having problem uploading files to my amazon ec2 ubuntu instance to the /var/www folder. permission denied. 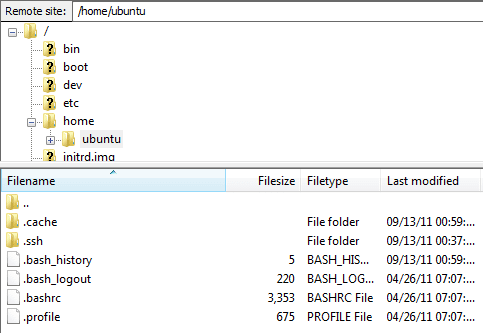 i am authorized only to upload files to /home/ubuntu folder ..
kindly help me to sort out this issue . 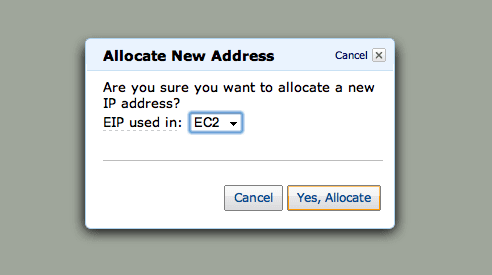 Question - we have installed ec2 and can see wordrpress via ip no problem. we can also see the files in ec2 user but when we ftp in to what would be public html no file tree exists. 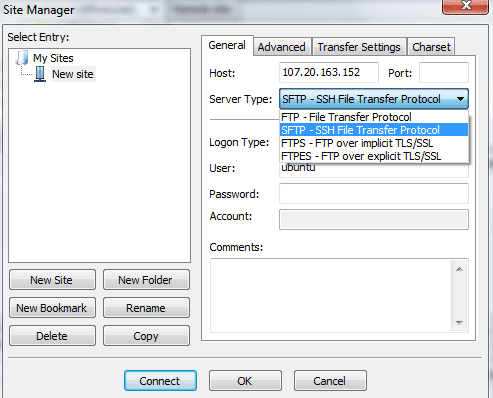 It appears our ftp login is within the user account (at root level), not at the real "root" of the server. how do we do it at real root - goal is to see file tree? how to access phpMyAdmin Sir? Thanks Srinivas, This was really helpful.